A university in Pennsylvania is going against the grain of the anti-conservative bias on college campuses with a course related to President Donald Trump that isn’t hostile to conservative students, according to Campus Reform. Lock Haven University professor Kimberly Johnson will be teaching a sociology course titled “Culture and Society in the Age of Trump” in the fall. Johnson told Campus Reform that she wanted to create an environment where students, regardless of political affiliation, can have open and productive discussions about Pres. Trump and his impact on the country. “Conservative students have told me that they wish they had a class where they could openly express themselves, particularly concerning Trump and his politics,” Johnson said. "For me, it doesn't matter what a student's views are on our current president; I hope to provide an environment where we can genuinely examine what is going on in society during such turbulent times." “Students will learn about race, class, and gender and how these important societal components were directly applicable to the presidential election and the reaction that followed," the course description states. "This course also examines the sociological background to some of the key elements that shaped global society and culture, such as populist movements." Did the school oppose it? Johnson said that even though Lock Haven, like many universities, leans left politically, approved of the educational value of open and non-judgmental discussion. “I would love to see [schools] return to its classical days where both theory and research were objective areas of serious study,” Johnson said. If students enroll in our sociology program at LHU, they can get a taste of that." Rep. Dan Crenshaw (R-Texas) slapped down a proposal by Sen. Elizabeth Warren (D-Mass.) to put the taxpayer on the hook for more than a trillion of student loan debt. "Student loan debt is crushing millions of families," said Warren in her tweet. "That's why I'm calling for something truly transformational," she continued. "Universal free college and the cancellation of debt for more than 95% of Americans with student loan debt." Crenshaw shot down the proposal and explained why he thought her policy was "terribly clumsy" and unfair. "Loan forgiveness for people making up to $250k?" Crenshaw responded with a link to Warren's tweet. "This plan effectively asks all Americans," he continued, "many of whom never got a degree, to give their tax dollars to people who CHOSE to take out a student loan so that they COULD get a job paying $250k a year." "Terribly clumsy & unfair policy," he concluded. Warren's presidential campaign has been struggling to gain traction, causing some of her supporters to claim that sexism is keeping voters and Democrats from taking her seriously. Piers Morgan pointed out a curiosity about the difference between the attention Rep. Alexandria Ocasio-Cortez (D-N.Y.) paid to terror attacks that targeted Muslims versus that which targeted Christians. Twitter-obsessed @AOC posted 14 times about the terror attack on Muslims in New Zealand, but has posted nothing about the terror attack on Christians by Muslim extremists in Sri Lanka," Morgan noted. He was referring to a series of horrific bombings on the Christian religious day of observance for Easter that killed at least 321 at last count, and injured hundreds more. But while Ocasio-Cortez showered attention on the terror attacks on Muslims in New Zealand, she showed such interest in that on Christians. In one controversial tweet after the New Zealand terror attacks, Ocasio-Cortez appeared to mock those offering prayers for the victims. "What good are your thoughts & prayers when they don't even keep the pews safe?" she tweeted. In another tweet, she praised the government in New Zealand for banning guns after the attack. "This is what leadership looks like," she tweeted. TheBlaze could not substantiate the claim that Ocasio-Cortez tweeted 14 times about New Zealand, which appears to be repeated often on social media, but without evidence. Other Democratic politicians have been criticized for their response to the terror on Christians in Sri Lanka, including former President Barack Obama and Hillary Clinton, who referred to the victims as "Easter worshippers." On Tuesday, ISIS claimed responsibility for the heinous Easter attacks. A 20-year-old college student in upstate New York reported an Uber driver for refusing to take her to get an abortion. According to the women’s account, which was reported on by Yahoo! Style (UK), the ride-sharing company canned the pro-lifer. But now the woman is looking to take legal against the driver. “I’m in college in upstate NY and I don’t have a car on campus because it’s expensive,” she wrote in a message posted to Reddit earlier this month. “I’m 20 years old and I found out I was pregnant and subsequently decided I wanted an abortion because I’m in no position to care for a child,” the woman said. She found a clinic about an hour from her university, because the nearby Planned Parenthood had a schedule that didn’t work for her. “Because I don’t have a car, I rely on Uber and [L]yft to get me places,” she said. The student then recounted her interaction with the Uber driver, who attempted to dissuade the woman from choosing abortion before telling her he could not drive her to the clinic. “He said ‘I’m sorry, but I can’t take you the rest of the way. I can take you back to [my city], but you won’t be able to find another Uber out here,’” the post read. “After he left, a cab came and I got to my appointment (an hour late),” the post read. The driver, who otherwise had good reviews from patrons, was fired after the woman filed a report against him. “Within a few days they reached out again and told me the driver had been banned from Uber,” the woman added. But the driver being fired was not enough: “However, I’d like to pursue further legal action against the driver if at all possible. Do I have a case? What should my next steps be?” she asked via Reddit. “I reached out to a law firm and a few legal aid societies but nothing has happened. I’m not sure what I should do now,” the woman said. The costumed star of a viral video of the "Easter Bunny" throwing punches in defense of a woman on a sidewalk in downtown Orlando, Florida, on Sunday night has been identified — and, according to law enforcement, he's got a lengthy criminal record that includes multiple armed robberies and a warrant out for his arrest in New Jersey. The #HEROBUNNY's meteoric rise to fame included a new Instagram account, "BadBunnyof19," that celebrates the costume crusader as "Protecting The People!" and the leader of the apparently newly formed #BUNNYGANG. (A few Bad Bunny Instagram posts below.) But Bad Bunny's rise to fame has also brought to light his real name, Antoine McDonald, and with it, his criminal record. "After the video went viral, McDonald spoke with several news outlets and even created an Instagram account to celebrate his newfound fame, leading multiple local police departments to speak out about the costumed vigilante's criminal past," AOL.com reports. McDonald, 20, is a fugitive from New Jersey who is wanted in connection to a vehicle burglary in South Brunswick that occurred in September 2018, The Tampa Bay Times reported Tuesday. He's also a "person of interest" in two armed robberies and a car-jacking in the state. "Pasco County authorities discovered that there’s a 'non-extraditable failure to appear' warrant out of New Jersey for Antoine McDonald, 20, of Zephyrhills," WFTV9 reports, citing an incident report issued by Pasco County Sheriff's Office. "Authorities said McDonald was a person of interest in a carjacking and two armed robberies in Pasco County, according to the Sheriff’s Office. He had also been arrested in January on charges of having a fraudulent ID and using the name Hudhayfuh Roberts." Along with the New Jersey incidents, McDonald's record reportedly includes arrests in Delaware in 2017 for two armed robberies on another holiday, New Year's Day. He was ultimately "charged with two counts of robbery, possession of a firearm during the commission of a felony, second-degree conspiracy and tampering with physical evidence in relation to the incident," AOL reports. Just a few weeks after being arrested for using a fake ID to rent a U-Haul in New Jersey in 2019, the outlet notes, McDonald was charged with reckless driving in Florida. Actress Nicole Kidman says that her friends often give her a lot of flak her over her faith and the fact that she raises her children in the church. In a recent interview with Vanity Fair, the Oscar-winning actress said that faith is an integral part of her life. "A lot of my friends tease me," the 51-year-old actress admitted. Australian-born Kidman, who is married to country music star Keith Urban, said that she and her husband take their two daughters, 10-year-old Sunday Rose and 8-year-old Faith Margaret, to church regularly. "That's how we are raising our children," she said. "Keith has his own beliefs, but he comes, too. I had a very Catholic grandmother, and I was raised praying, so that had a massive impact." Kidman, who was formerly married to Scientologist actor Tom Cruise, also added that she isn't afraid of raising her daughters to believe in God, and encourages them to question their faith if they feel compelled to do so. "I wouldn't say it's absolutism, there's constant questioning," she said. "I'm a willful, feisty girl. For me, it's very important that I don't have judgment. My dad would always say, 'Tolerance is the most important thing.'" In 2018, Kidman discussed the importance of her faith in an interview with Allure. "I'm spiritual in the sense that I absolutely believe in God," she told the magazine. The actress also explained how she once considered being a nun before she went into the entertainment business. "I loved the idea of being a nun. Obviously, I did not choose to go that path, but I was very drawn to it," Kidman said. When she was married to Cruise, she and her ex-husband adopted two children, Bella and Connor, who later became Scientologists. In an interview with Australia's Who, Kidman said that she doesn't judge her older children — now 26 and 24 years old, respectively — or the path that they've chosen. "They are adults," she said in a 2018 interview. "They are able to make their own decisions. They have made choices to be Scientologists and, as a mother, it's my job to love them. "And I am an example of that tolerance and that's what I believe — that no matter what your child does, the child has love and the child has to know there is available love and I'm open here. I think that's so important because if that is taken away from a child, to sever that in any child, in any relationship, in any family — I believe it's wrong," she insisted. "So that's our job as a parent, to always offer unconditional love." Democrat presidential candidate Sen. Kamala Harris (D-CA) changed her tune about letting convicted terrorists vote less than 24 hours after being asked the question during a CNN town hall on Monday night. CNN's Don Lemon asked Harris if she supported comments made earlier in the night by socialist Sen. Bernie Sanders (I-VT), who said that convicted terrorists, including the Boston Marathon bomber, should be allowed to vote in U.S. elections while in prison. "Another issue that I want to talk to you about — this is really important — I'm not sure if you were watching earlier, but Senator Bernie Sanders said that he is in favor of felons being able to vote while serving in prison," Lemon said. "He was asked specifically about people like the Boston Marathon bomber, also people who are convicted of sexual assault. And he said, this is a quote, 'The right to vote is inherent to our democracy, yes, even for terrible people.' Do you agree with that, Senator?" "I agree that the right to vote is one of the very important components of citizenship and it is something that people should not be stripped of needlessly, which is why I have been long an advocate of making sure that the formally incarcerated are not denied a right to vote, which is the case in so many states in our country, in some states permanently deprived of the right to vote," Harris responded. "But people who are in — convicted, in prison, like the Boston Marathon bomber, on death row, people who are convicted of sexual assault, they should be able to vote?" Lemon pressed. "I think we should have that conversation," Harris responded. Less than 24 hours later, Harris appeared to have changed her tune, telling a group of reporters: "Do I think that people who commit murder, people who are terrorists should be deprived of their rights? Yeah, I do." This is not the first time that Harris has completely changed her stance on an issue following a CNN town hall event. In January, while talking about the health care system, Harris said: "I believe the solution — and I actually feel very strongly about this — is that we need to have Medicare for all. That’s just the bottom line." 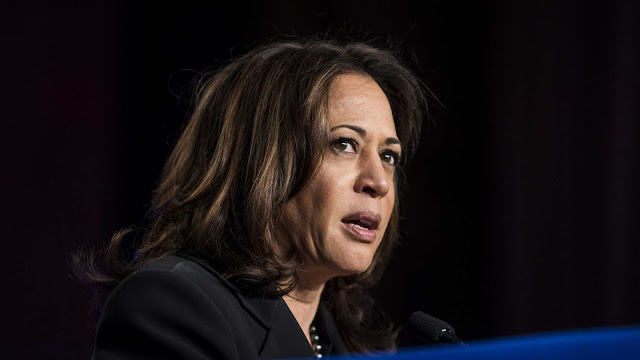 CNN's Jake Tapper pressed Harris on her statement, noting that she would be eliminating private health insurance: "So for people out there who like their insurance, they don’t get to keep it?" "Let’s eliminate all of that," Harris responded. "Let’s move on." As the furor grew, a Harris adviser on Tuesday signaled that the candidate would also be open to the more moderate health reform plans, which would preserve the industry, being floated by other congressional Democrats. It represents a compromise position that risks angering "Medicare-for-all" proponents, who view eliminating private health insurance as key to enacting their comprehensive reform. "Medicare-for-all is the plan that she believes will solve the problem and get all Americans covered. Period," Harris national press secretary Ian Sams told CNN. "She has co-sponsored other pieces of legislation that she sees as a path to getting us there, but this is the plan she is running on."